We knew that Android support was coming to the Withings Activité and the Withings Activité Pop, and today it's arrived: just a few days after the deadline that the manufacturer had set itself. 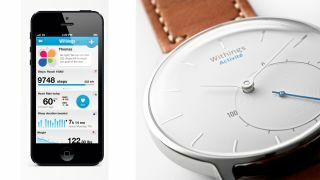 You can use Withings' own Health Mate app on Android to track your steps and distance, or plug the data into Google Fit instead – Withings says the Pop and the original Activité now work with Google's own health platform. It coincides nicely with the arrival of the Activité Pop in European markets outside the UK, and it means when the Pop finally goes on sale in the US, Android users won't have to wait to pick it up. If you were holding back on picking up an Activité or an Activité Pop because you didn't have an iPhone, you don't have to wait any longer. Both smartwatches feature the same sleep tracking and step counting capabilities, though the more expensive Activité is made from premium materials and is more easy on the eye. That said, both timepieces do a decent job of melding fitness tracking with something that you might actually want to wear. There are no smartphone notifications to disturb you, just a secondary dial that shows how close you are to your fitness goals. "Following on from the overwhelming reception that both the Activité and Activité Pop have received on their elegance and design, we have listened to our dynamic Android community and it seemed natural for us to quickly provide Android compatibility for each product," said Withings CEO Cédric Hutchings. Best smartwatch 2015: which is right for you?